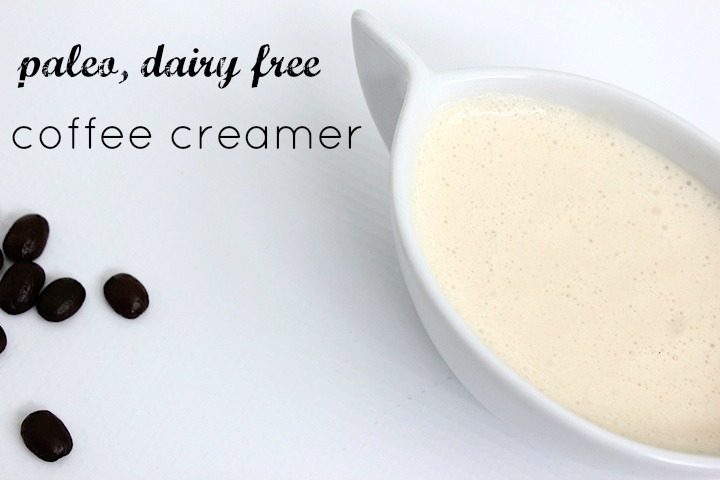 For so long I’ve been trying to create a dairy-free coffee creamer. Finally one morning I decided to try to make it, and here’s the product! 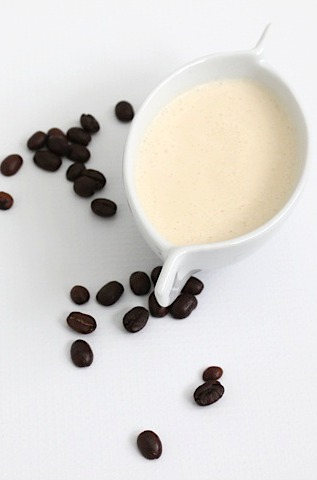 A Paleo Coffee Creamer Recipe. One of my favorite things to do in winter is cuddle up and drink coffee. I’m not sure if I’m a coffee addict or not. I don’t think I am, but I do really enjoy the experience of a cup of coffee. I could probably write a post on my relationship with coffee, but that’s for another time. 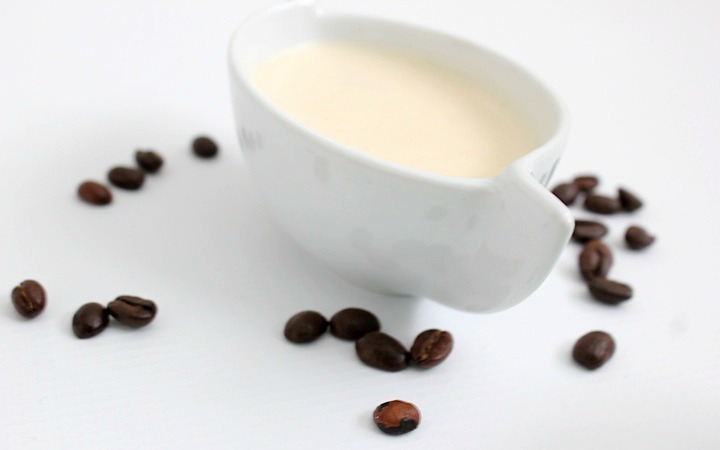 Coffee creamers are usually filled with preservatives, high fructose corn syrup, and processed ingredients. So what do you use? 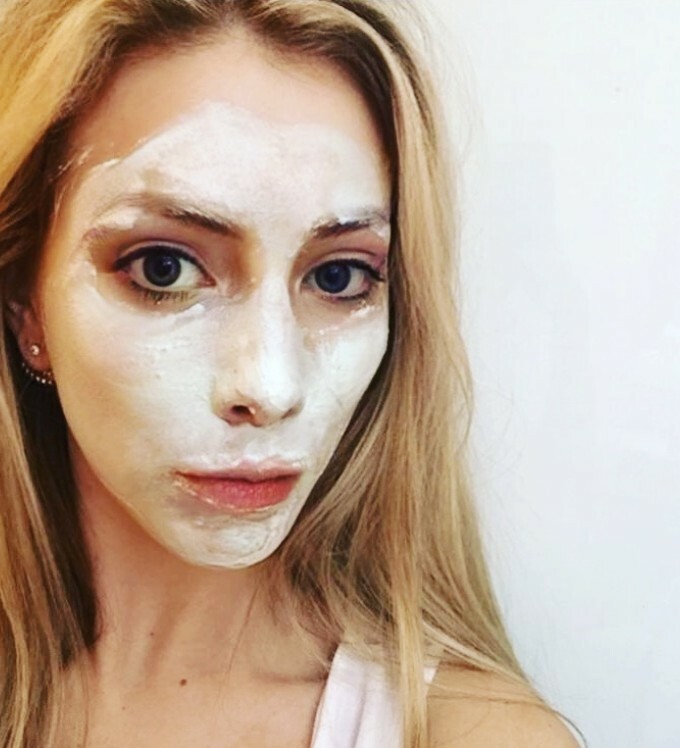 Milk? No thanks, it has a very high glycemic load. Whipping cream? Yumm… but many Paleo followers avoid dairy! So up until this beautiful creation (my dairy-free creamer), I enjoyed it black. 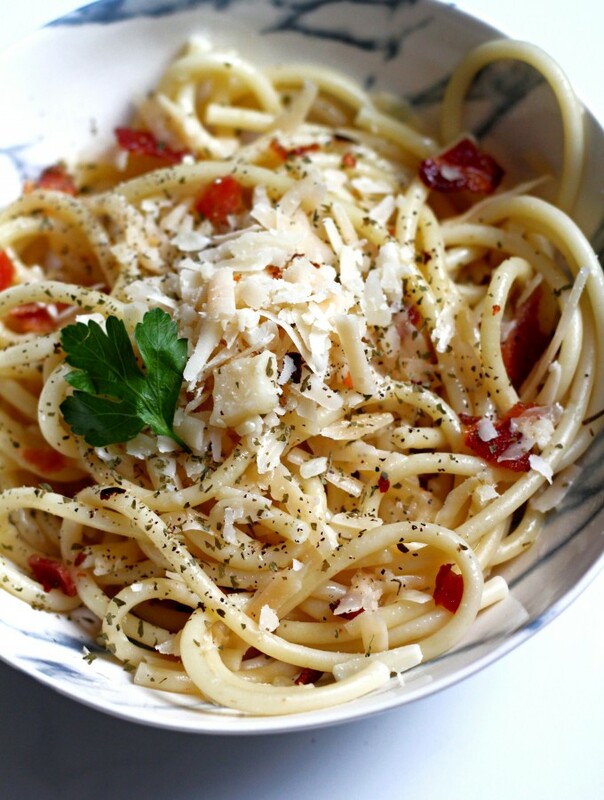 This recipe came about by simply blending 1 can of coconut milk, 2-3 eggs, and 2 teaspoons of vanilla in a food processor. After I made one jar of it, I was hooked! Now I’ve been making it every week and keeping it in my fridge. My friends all think it is delicious too! The vanilla is optional. It does change the flavor of the coffee, so if you are a purist don’t add vanilla . If you’re wondering if coffee is good for you? 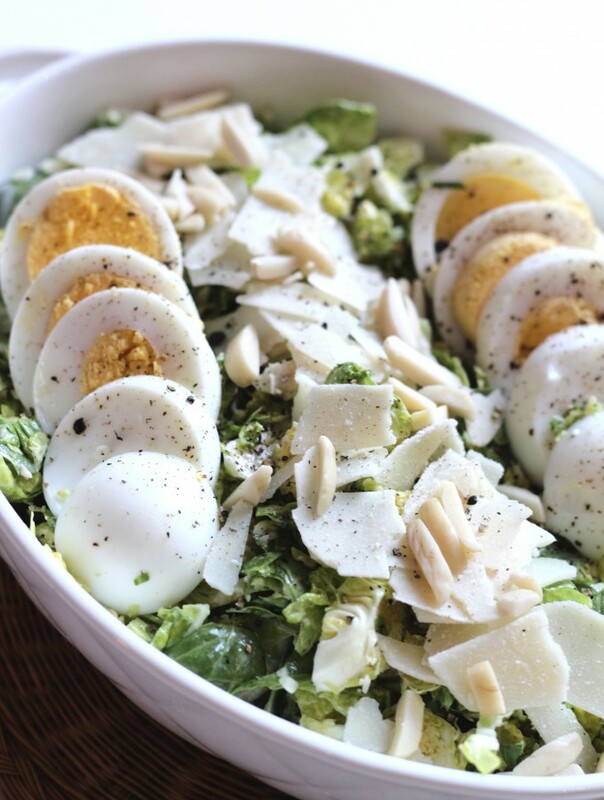 Here is what my friend Dietician Cassie says about it. Blend all ingredients in either a food processor or blender. Store in fridge for 4-5 days. I don’t feel comfortable eating raw eggs. I use So Delish coconut non dairy creamer. You could get pasteurized eggs from the store to be safe. I also get a bot freaked about raw eggs since I get mone straight from the chicken. I like to use one can of coconut mill mixed with one can of coconut cream. I will add vanilla, coco, or cinnamon sometimes. It is sweet from the coconut cream, so I only use a few table spoons. It gives the coffee such a good mouth feel. Yum sounds good! I have no problem with raw eggs but that sounds like a good alternative. Actually, raw eggs straight from farm chickens are pretty safe. It’s the raw eggs from the store that you should get concerned about. Hi, what s the coconut mill mixture? I LOVE coffee also!! Since going paleo I have been drinking it black also. It’s okay, I do miss the cream. I’m interested in your creamer, can you tell me the purpose of the eggs?? The eggs make it thicker and creamier! If you feel uncomfortable using raw eggs just use coconut milk and/or coconut cream. How much of each to use? I don’t feel comfortable eating raw eggs either. I will however try just the canned coconut milk. I never thought of that! Understandable! The coconut milk will do just fine. If you’re freaking about raw eggs (I don’t) one way to remedy that is to heat the coconut cream over medium heat until it starts to steam. Remove from heat. Temper the whisked eggs by adding a big spoonful of the heated coconut milk and stir like mad (you don’t want to COOK cook the eggs so that they scramble, just want to raise their temp slowly). Add another spoonful and stir again. I do that a couple three times and then it’s safe to pour the egg mixture into the remaining heated coconut milk. I used to love me some chemicals in my coffee as well (HELLO HAZLENUT)!! I nearly gave up coffee because I couldn’t face a cup without a splash of that stuff in it. I had to get creative as well. I use the same method I mentioned above only with full fat cream, an egg or two and a splash of maple syrup. I’ll have to try coconut milk next week because it sounds so delish. She’s RIGHT! That is a great method! Heavy cream is deeelicious too, but I’m off dairy now. Thanks for sharing with everyone! For those of you who may be squeamish of the raw eggs. No worries. The hot temperature of your brewed coffee will tenor the eggs and make them safe to consume. I have a B.S. in Nutrition and Food Science. I wouldn’t mess around wi consuming something that might make me sick on a daily basis, but I think this is totally safe. Actually that’s not true if you’re worried about salmonella. To kill salmonella your food has to be at least 158°F for at least 10 min, if you add your cold (possibly even directly from the fridge) coffee creamer to a cup of coffee, the temperature will not be high enough for at least 10 minutes. The creamer is good btw I used a vanilla bean instead of the extract, but if you do, you need to strain the creamer if you don’t want to chew your coffee. *temper the eggs….. dang autocorrect. Ohhhhh this sounds BEAUTIFUL. Thanks for the recipe, I’m so excited to try it! In Australia you can buy powdered eggs (no salmonella!) in the same aisle as the fresh ones. Just prepare the equivalent of however many eggs you need as per the packet instructions, and you’re there! I thought it would make a good simple protein shake powder – the first thing I noticed was that NO it doesn’t taste eggy, and secondly it does make a beautiful texture. I’m all for avoiding the possibility of salmonella poisoning, go for it! Thanks….I’ll have to try this! Although today I made my coffee black with one drop of vanilla stevia and a sprinkle of cinnamon. It was great! I found you from the Whole30 fb page today. I really like your blog too!! Thanks for the great idea! Jenny! That’s awesome that you’re on Day 15! GO YOU! Whole30s are hard but so worth it. Thanks for sharing the coconut milk recipe, I must try that out. Raw eggs rock, glad you agree. My Husband and I are doing a Paleo week so I was excited to see this. I have made paleo recipes before and my one issue I’ve had is although I love coconut, it seems like everything taste like coconut. Lol. I tried this recipe today and decided to use Almond milk instead of the Coconut milk since I’m pretty much a plain coffee drinker. Anyway… It is fantastic! I just had my first cup of Organic Coffee with Organic raw Honey and this creamer. Couldn’t be more pleased! :). Thank you! I tried to make this coffee creamer, but when I poured my coffee into it, it created chunks. I am assuming from the eggs. Any ideas? Hmmm… Mine doesn’t do this. Did you stir well after? or did the chunks stay? I wasn’t sure about this recipe, not the raw eggs thing( hello raw cookie dough). I thought maybe the eggs would scramble when I added it to my hot coffee, and that maybe it would taste like egg nog. Well it did not scramble and it does not taste like egg nog :). I added a few pitted dates to it and it tastes just like coffee creamer, it gives it that creamy texture I haven’t been able to achieve. I’ve tried a ton of differnt nut/ coconut milk combos and this is the best. Thanks so much for sharing!!!!! Yay Meredith! Thanks for commenting!! When you say store in fridge for 4-5 days do you mean that is how long it keeps or do you mean store 4-5 days before use? That means you can keep it there for 4-5 days, not store before using. I will clarify in the post. Love the recipe. Does it matter the size of the eggs? Doll, you give me hope! Don’t know if you will specialize, but if you have any patients come in with IBD symptoms, I am sure you will not say to eat anything because food doesn’t matter. Right before I was relieved of my colon (around your age?) I was living on white flour biscuits and “medical” milkshakes (forgot the name of that stuff). Nobody knew better. I only eat raw eggs, look up the choline content in raw yolks vs whites and honestly you could just eat the yolk raw. Buy organic free range or buy a chicken. Hi Monica, thank you for the post. I wonder if I can beat the eggs in a stand mixer while heating the coconut milk on the stove then drizzle the hot milk into the mixing eggs to make a thick creamer. What do you think? that sounds like it would work! Let me know how it comes out.